"Improve Your Photography and Tell Your Story"
Photographic workshop sponsored by the Photographic Society of Sri Lanka at the Lionel Wendt Center in Colombo. 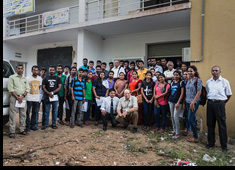 Michael Sarnacki receives an Overseas Cultural Grant from the U.S. State Department for expenses related to the presentations and exhibition of the project at the American Center in Colombo. June 18, 2012: Sri Lanka Embassy in Washington D.C. Celebrates the Launching of "Sri Lanka and the Kandy Esala Perahera"
At long last, the shipment of books arrives from Hong Kong. Sri Lanka receives 200 copies that are sold out in one week. We receive 1,000 copies and quickly arrange to ship 200 more to Sri Lanka. A few days ago a small number of advance copies of the Sri Lanka book arrived. What a joy! I am very pleased with the production and really glad that Ive had the opportunity to have complete control over the content, look and feel of the book. I think Ive seen just about every book produced about the Kandy Esala Perahera and I can say, with all modesty, that this is the finest book ever produced about one of the world's greatest events. Simply put, its all that I hoped it would be and I look forward to sharing it with each of you. There are only 1200 copies of this first edition printed. Two hundred copies will arrive in Sri Lanka in a few weeks and one thousand copies will be distributed from the United States in early May. If you are interested in purchasing a book, or the special book and print edition, I would urge you to pre-order soon. design and layout, printed sheets, varnish pages, cover color, end sheets, slip case, book jacket, gold foil stampings, etc. We are very pleased with the entire production and cant be more excited. We should be receiving a small number of advanced copies for promotion in a few weeks. The large shipment of all complete books is scheduled to arrive in the United States (1000 copies) and in Sri Lanka (200 copies) in mid-May. We are now accepting pre-orders for the book. Orders can be placed using this site or through Amazon.com. Since there are only 1200 copies of the book printed for worldwide distribution, we would urge you to pre-order you book immediately. We are also in the process of producing prints for the premier exhibition of this project from May 31-June 14 at the Swords Into Plowshares Gallery in Detroit, Michigan. We will keep you informed as this event nears. Be sure to follow us on Twitter and Facebook. Today Trista Sample and I signed off on the last of the proofs for the Sri Lanka book - including the slip case, the book jacket, book cover, varnish pages, UV coatings, gold foil stampings, photos, photo placement, captions, text, and overall look of the book. It's now in the hands of the craftsmen and craftswomen at Everbest Printing in Hong Kong. Needless to say we are excited to be this close to the completion of the book. We are planning a book signing and exhibition event sometime in the months to come. When we know the expected delivery date of the book, we will let you know when and where the event will take place. Today we formalized arrangements with a book broker for the production of Sri Lanka and the Kandy Esala Perahera. Trista Sample and I have been working with book designer Mayapriya Long since July and together we've created something really special. The process has taken longer than I first thought, but I have to keep reminding myself that, "What is made with time, time respects." I would anticipate that the book will be available sometime in very late February or early March. We will most definitely have an exhibition and opening reception somewhere in the Detroit area to formally launch this body of work. I will keep you informed about all the planning in the months to come. I'm looking for a suitable venue now, if you have any ideas please let me know. The photo above right shows the front jacket cover. The yellow title and framing will be gold foil stamped and the photograph will be UV gloss coated  so it should look wonderful! The book has 272 pages and more than 300 photographs and illustrations. Obviously we'll be monitoring the production of the book as closely as we can. It seems that soon this dream will become a reality. 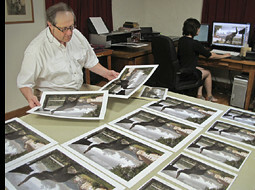 July 31, 2011: Design production begins. Michael meets with book designer Mayapriya Long. 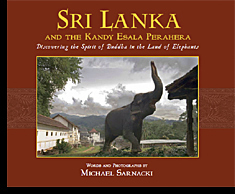 The most recent issue of Serendib Magazine published by BT Options includes a feature story on Michael Sarnackis work about the Kandy Esala Perahera. 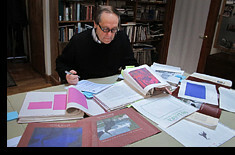 The issue includes both photographs and the written text by Michael Sarnacki. The magazine will be distributed in all fights of Sri Lankan Airlines during the months of June and July of 2011. Through the thoughtful generosity of more the 175 individuals the fundraising effort on Kickstarter was successful. The projects goal was surpassed on the very last day of the program. 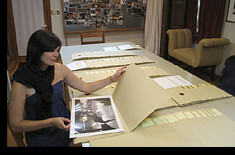 In the coming weeks the manuscript and photographs will be turned over to a superb graphic artist for book design. Please check back here for further updates. Thank you all for your support and well wishes. Today we started a major fundraising effort using Kickstarter, a site used by artists to raise money to produce their project. A video on the site explains the project and what the funds will be used for. The funding goal is $20,000. The deadline for the fundraising effort is June 1st. If the goal is not reached, we receive no funding. It is an all or nothing proposition. We urge everyone to visit the site and make a contribution to this project. It also is important to inform your friends and colleagues about this effort. To support this project through Kickstarter, please click here. I've just arrived home again after spending the last three weeks in Sri Lanka. It seems that the majority of my time was spent traveling to attend meetings regarding the publication of the book. During my travels to Colombo, I met with Dammikka Sriwardhana, a very talented designer, along with Dharani Karunaratne, a Sri Lankan publisher, who is "very keen" on printing and distributing the book. I am eagerly awaiting a formal proposal from these individuals which will detail an arrangement to design and publish this assembled body of work. Although I had less time to photograph this trip, I did have time to make a few new friends and reacquaint myself with some people Ive known for many years. I again had the opportunity to meet with Sri Lankan President Rajapakshe. He looked a bit tired and I couldnt help but tell him not to work so hard. He laughed and said he had no option. 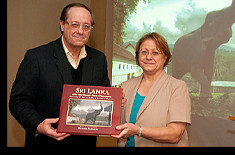 American photographer Michael Sarnacki presents a copy of his manuscript, Sri Lanka and the Kandy Esala Perahera; Discovering the Spirit of Buddha in the Land of Elephants, to Ambassador Jaliya Wickramasuriya. 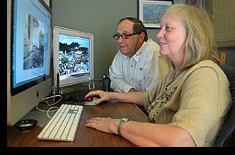 Mr. Sarnacki has been researching and photographing the festival since 1995. The project is meant to increase international awareness about Sri Lankas important religious and cultural heritage. Under the direction of Ambassador Wickramasuriya, plans are now being made for a major book and exhibition. Both the book and exhibition will be made available in the United States, Canada, in numerous European countries, and of course in Sri Lanka. These special projects, detailing the grand Kandy Esala Perahera, are expected to add to an increase in tourism. 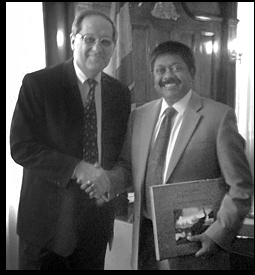 Michael Sarnacki met with Bandula Jayasekara, Consul General for Sri Lanka, to discuss the project as well as publication and exhibition possibilities. On Poya Day, Sri Lanka's President, Mahinda Rajapakshe, was presented with a manuscript of the book and a photograph of an elephant in front of the Dalada Maligawa. The presentation was made at the Presidents House by the American author and photographer, Michael Sarnacki, accompanied by Dhammika Swarnasinghe and Buddhie Ramawickrama of Kandy as well as Sarath Ekanayake, Chief Minister of the Central Province. The book will go into production in the coming months and a series of exhibitions are being planned to coincide with the publication. Exhibitions of the photographs are being planned in the United States, Canada and at the Queens Hotel for all Kandyans to view.